Each of our delightful boys has what I (the person who spends a lot of time with them) would call a strong personality. It has little to do with textbook definitions and everything with the fact that there simply are no wallflowers at our house, no demure, ‘let’s go ahead and do it your way’ types. I’m content with this arrangement, at least theoretically speaking. I like the idea of everyone having their own opinion, or being passionate about different things. But, more often than not, three strong personalities means a lot of head-butting and a lot [A LOT] of yelling. We banished sent them all outside for a bit yesterday, to play in the snow and to utilize the surplus energy they seem to generate when cooped up inside the house. The professor joined them outside to tidy the garage and I sneaked away for a few hours. When I returned, my better half convulsed with laughter as he relayed another epic brotherly disagreement. 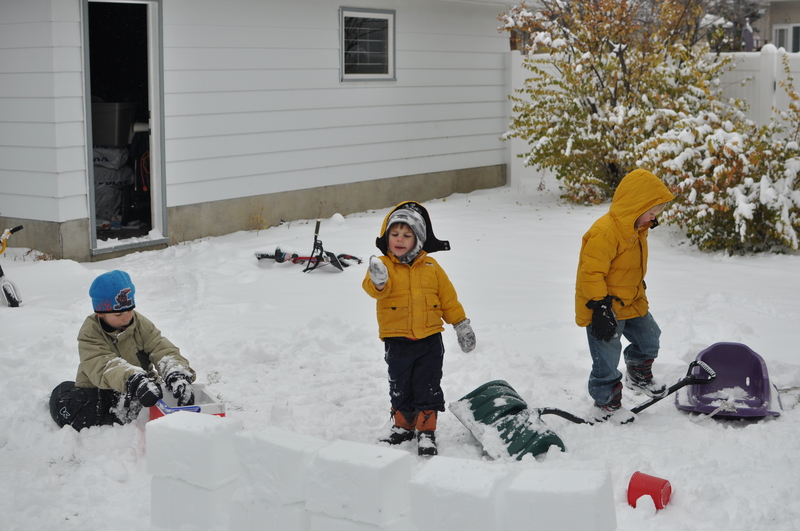 These artistic differences resulted in a lot of snow throwing and crying between the oldest two while the littlest man took it all in. He’d been building (err, making) his own pile of something and the Gort walked over to have a look. Fast forward to this afternoon, when I was standing in the kitchen making soup or who knows what. The Gort yelled for me to come outside to look at what he’d made in the snow. So I donned my boots and coat and ventured out in the snowy yard. The artist was standing proudly beside his latest creation. To my untrained eye it bore an uncanny resemblance to….. [half of] a bosom. I tried to keep a straight face, whilst willing the professor to look up from his basement office at his son’s handiwork. ‘Do you like it?’ the Gort asked, eager for my enthusiastic support. I smiled, ‘it’s a….’ and, having learned a thing or two, I drifted off waiting for him to tell me what I was looking at. ‘It’s a volcano,’ he informed me.